This week, we're celebrating the gulls of the world! Join us as we highlight these social and intelligent birds! Today we're sharing some keywords that pertain to gulls. This gull glossary also includes definitions that apply to other bird families, but are important topics to understand when studying gulls. An animal that eats mostly other animals is said to be a carnivore. Gulls are carnivores that feed opportunistically in a variety of ways. If the range of a species covers much of the world, it is said to be cosmopolitan. In mammals, the Killer Whale is cosmopolitan because it is found in nearly all of the world's oceans. The gull family is cosmopolitan; gulls are found all over the world. Exocrine glands secrete matter via a duct. There are a variety of exocrine glands in different animals, including sweat glands that excrete sweat, and salivary glands that excrete saliva. Gulls have special exocrine glands that excrete salt, allowing them to drink from salt water as well as fresh water. The taxonomy of gulls is complicated, and scientists make new discoveries on the relationships between species and subspecies all the time. Hybridization between closely-related species occurs on a regular basis. For example, Herring Gulls and Glaucous Gulls are known to interbreed in Greenland and Iceland. The offspring are known as "Nelson's Gull." The act of feeding be stealing food or prey from another is called kleptoparasitism -- literally parasitism by theft. Gulls feed in many different ways, including this method. They may steal fish caught by other birds that are able to dive deeper under the water than gulls are able. When threatened by a predator or intruder, birds like gulls may work together to drive out the danger. This behavior is known as mobbing and may include vocalizations and movements meant to remove the danger. Birds that breed colonially, as gulls do, will often work together to keep all of the nests in the colony safe. Gulls stay with their mates for life. 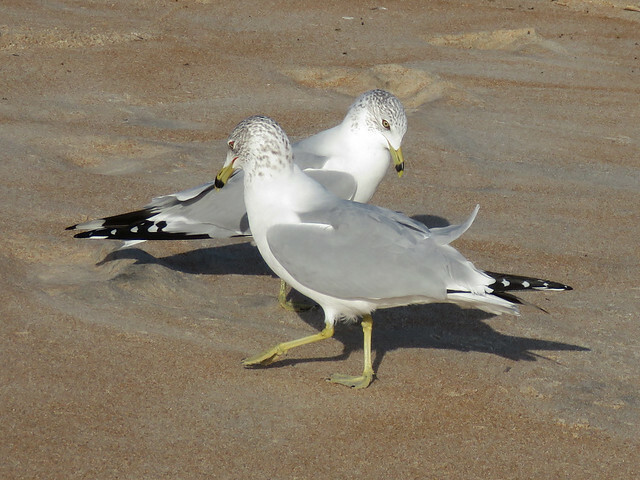 While many bird species have monogamous relationships during breeding season, gulls will remain a mated pair season after season, for the life of the birds. Gulls are able to survive and thrive in a variety of habitats and circumstances. Part of their success is their ability to feed opportunistically. Gulls are able to take advantage of available food sources in the moment; they are able to "improvise" a meal from almost anything edible. Opportunistic feeding is advantageous to a species that may face changes in its environment. An opposite feeding strategy, specialization, means that a species needs specific circumstances to be true in order to eat. When the breeding season begins, mated pairs re-establish or strengthen the relationship through different rituals. These rituals are known as pair-bonding. In gulls, this may involve special calls or vocalizations, sometimes accompanied by walking together or dancing, and nest-building. When a just-hatched baby bird is relatively advanced, it is considered precocial. Gulls have precocial young; the birds hatch covered in feathers and they are able to stand, walk, and feed themselves within a short amount of time. Birds that are the opposite of precocial, altricial, hatch nearly featherless and completely helpless, often with their eyes closed. They rely on their parents for everything until they are mature enough to start moving about on their own and care for themselves.